If markets have been blissfully ignorant of potential fallout from the simmering US-China trade dispute (even if corporate executives are bracing for the worst), just imagine how they would react to the reality of a military confrontation. Which brings us to an ABC News report published Monday evening detailing just how close Chinese ships came to actively confronting the USS Decatur while the US ship was carrying out yet another in a series of “freedom of navigation” operations – or “freeops” – in the South China Sea. 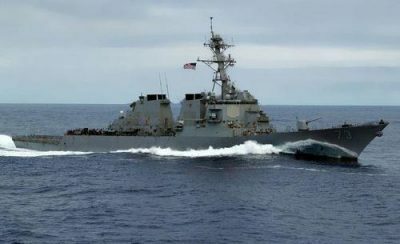 The Navy destroyer had to maneuver to avoid a Chinese ship that came within 45 yards of its bow while the Decatur was sailing through the Spratley Islands on Sunday in what was the closest direct confrontation between US and Chinese ships since Trump’s inauguration (after which the Navy began conducting these freeops with increasing frequency). The encounter, which comes at a time of strained relations between the world’s two largest economies driven largely by Trump’s aggressive trade policy, was characterized as “unsafe and unprofessional” by Navy officials. During the brief encounter, the Chinese destroyer’s aggressive maneuvers were accompanied by demands that the Decatur leave the area. Earlier Monday, reports surfaced that China had called off a security conference with US officials. The cancellation was later confirmed by the US. This latest sign of a deteriorating relationship came after the US Air Force flew a B-52 bomber on a mission through the East China Sea while two other B-52 flights were carried out through the South China Sea. While the the notion of a shooting war between the US and China may seem remote to casual observers, some market observers have noted the time honored progression of economic tensions like trade wars and currency wars eventually leading to a full-on hot war. At the very least, it’s a risk that certainly deserves attention.